Midwinter is also the time for Scandinavians to turn toward the sagas or Wise Women-Storytellers, for the reading of the runes. The staves of soft wood or small, flat stones were carved with symbolic pictographs, which, when cast and read in combination by the sagas, it was believed could reveal the fate of a tribe or an entire kingdom. Thus, the word saga indicates a family history, or story of the tribe’s destiny. For the Romans the usually grumpy and disapproving god Saturn, known as the Sun of Night, suddenly became jolly with the lengthening of the days. We can surely relate to this change in personality! Saturnalia, as the celebration after the Solstice was called, was a time of wild carrying-on, drinking, eating and general merriment. And, Saturn also offered a chance to “take your medicine” for the New Year. Saturn’s symbolic sign was comprised of the ancient letters RX, signifying the healing aspects of the return of the sun after the shortest day of the year. One of the first New Year acts of resolution for many early Romans was to write these letters on pieces of paper and eat them in the hope that their curative powers alone would dissolve some of the damage of bacchanalian debauches from the previous year. This celebration may be the first that also provided a “morning-after” prescription. Not every culture celebrates the new year after Yule or Christmas. For the pagan Celts, Mabon or the Autumn Equinox was the beginning of preparation for the next era. Between this time through Samhain, or All Hallows Eve and on until Yule, the season was considered wide open to release and revelry. Great bonfires were lit, and anyone who dared leaped over the flames to insure that the healing powers of the sun would stay with them throughout the dark stages of the new year. A horse-drawn cart with a beautiful village woman, symbolizing the pregnant Earth Mother Brigid, was led from cottage, to inn, to pub. 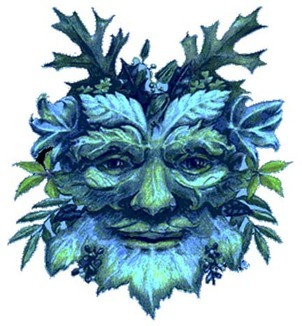 Accompanying the Earth Mother was the Green Man, a village lad, beloved of the local maidens who symbolized the fruits of the fields and was honored by the men as the Brother of all forest creatures. In the spirit of the harvest feasting and human generosity, groups who followed the cart went “a-souling” requesting, “Please good mistress, a soul-cake, an apple, a pear, a plum, a cherry, any good thing to make us all merry.” To insure prosperity and neighborly support in the coming year, food and drink were given to these early carolers, called “mummers,” especially because they would not remain quiet or “mum!” In turn they would often act out a bawdy story or religious mystery play with political overtones for assembled feudal lords and villagers. In these performances the villagers could portray the wealthy while the wealthy must remain humble and silent. May we remember the way our ancestors and our own souls have found their paths to this time of rebirthing and awakening light. In our New Year’s resolutions may we remember our Mother Earth, and our brothers and sisters—both two-legged and four-legged—in our determination to improve this tiny interconnected globe. May we remember the world’s food and population crisis and the fact that many Americans consume four times our comparative “fair share” of what some other parts of the world use. We must remember that if we consume to fill the emptiness of our dissatisfaction, we are most often devouring what others need to survive. For those of us who rose early on December 25th to light the symbolic fires of life and joined the worldwide silent meditation for peace and healing, a small part of the hope and promise of 2010 became part of our New Year’s resolutions. By joining millions of people from every culture around the world in this meditation, perhaps we are recapturing and activating the spirit of forgiveness and prophecy that were so important to our ancestors in their various New Year celebrations. For good reason, almost every culture believed in the prophetic qualities of the moment when one stands between the old and the new year. We may no longer have sagas or oracles to decree our futures to us, but we still surely believe in the human potential toward growth, and the healing transformation so necessary for our shared future. HAPPY NEW YEAR!